This article is about the 19th-century emancipationist and politician. For the boxer who was born Cassius Marcellus Clay, Jr., see Muhammad Ali. Cassius Marcellus Clay (/ˈkæʃəs ˌmɑːrˈsɛləs/; October 19, 1810 – July 22, 1903), nicknamed the "Lion of White Hall", was a Kentucky planter, politician, and emancipationist who worked for the abolition of slavery. He freed the slaves that were handed down as his inheritance from his father. Those freed slaves were allowed to stay and were paid a wage. He was appointed by President Abraham Lincoln as the United States minister to Russia during the American Civil War, and is credited with gaining Russian support for the Union. Cassius Marcellus Clay was born to Green Clay, one of the wealthiest planters and slaveholders in Kentucky, who became a prominent politician, and his wife Sally Lewis. He was one of six children who survived to adulthood, of seven born. Clay was a member of a large and influential political family. His older brother Brutus J. Clay became a politician at the state and federal levels. They were cousins of both Kentucky politician Henry Clay and Alabama governor Clement Comer Clay. Cassius' sister Elizabeth Lewis Clay (1798–1887) married John Speed Smith, who also became a state and US politician. Their son, Green Clay Smith, became a state politician and was elected to Congress. The younger Clay attended Transylvania University and then graduated from Yale College in 1832. While at Yale, he heard abolitionist William Lloyd Garrison speak, and his lecture inspired Clay to join the anti-slavery movement. Garrison's arguments were to him "as water is to a thirsty wayfarer." Clay was politically pragmatic, supporting gradual legal change rather than calling for immediate abolition the way Garrison and his supporters did. In 1833, Clay married Mary Jane Warfield, daughter of Mary Barr and Dr. Elisha Warfield of Lexington, Kentucky. They had ten children, six of whom lived to adulthood: Elisha Warfield Clay (1835 - 1851), Maj. Green Clay (1837 - 1883), Mary Barr Clay aka Mrs. J. Frank Herrick (1839 - 1924), Sarah "Sallie" Lewis Clay Bennett (1841 - 1935), Cassius Marcellus Clay, Jr. (1843 - 1843), Cassius Marcellus Clay, Jr. (1845 - 1857), Brutus Junius Clay II (1847 - 1932), Laura Clay (1849 - 1941), Flora Clay (1851 - 1851), and Anne Clay Crenshaw (1859 - 1945). Later, he adopted Henry Launey Clay, believed to be his son by an extra-marital relationship while in Russia. Cassius Clay was an early Southern planter who became a prominent anti-slavery crusader. Clay worked toward emancipation, both as a Kentucky state representative and as an early member of the Republican Party. Clay was elected to three terms in the Kentucky House of Representatives, but he lost support among Kentucky voters as he promoted ending slavery. His anti-slavery activism earned him violent enemies. During a political debate in 1843, he survived an assassination attempt by a hired gun, named Sam Brown. Despite being shot in the chest, Clay drew his Bowie knife, tackled Brown, cut out his eyes, and finally threw him over an embankment. In 1845, Clay began publishing an anti-slavery newspaper, True American, in Lexington, Kentucky. Within a month he received death threats, had to arm himself, and regularly barricaded the armored doors of his newspaper office for protection, besides setting up two four-pounder cannons inside. Shortly after, a mob of about 60 men broke into his office and seized his printing equipment. To protect his venture, Clay set up a publication center in Cincinnati, Ohio, a center of abolitionists in the free state, but continued to reside in Kentucky. Clay served in the Mexican–American War as a captain with the 1st Kentucky Cavalry from 1846 to 1847. He opposed the annexation of Texas and expansion of slavery into the Southwest. While making a speech for abolition in 1849, Clay was attacked by the six Turner brothers, who beat, stabbed and tried to shoot him. In the ensuing fight, Clay fought off all six and, using his Bowie knife, killed Cyrus Turner. In 1853, Clay granted 10 acres of his expansive lands to John G. Fee, an abolitionist, who founded the town of Berea. In 1855 Fee founded Berea College, open to all races. Clay's connections to the northern antislavery movement remained strong. He was a founder of the Republican Party in Kentucky and became a friend of Abraham Lincoln, supporting him for the presidency in 1860. Clay was briefly a candidate for the vice presidency at the 1860 Republican National Convention, but lost the nomination to Hannibal Hamlin. President Lincoln appointed Clay to the post of Minister to the Russian court at St. Petersburg on March 28, 1861. 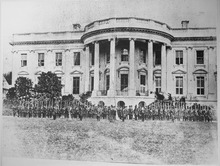 The Civil War started before he departed and, as there were no Federal troops in Washington at the time, Clay organized a group of 300 volunteers to protect the White House and US Naval Yard from a possible Confederate attack. These men became known as Cassius M. Clay's Washington Guards. President Lincoln gave Clay a presentation Colt revolver in recognition. When Federal troops arrived, Clay and his family embarked for Russia. As Minister to Russia, Clay witnessed the Tsar's emancipation edict. Recalled to the United States in 1862 to accept a commission from Lincoln as a major general with the Union Army, Clay publicly refused to accept it unless Lincoln would agree to emancipate slaves under Confederate control. Lincoln sent Clay to Kentucky to assess the mood for emancipation there and in the other border states. Following Clay's return to Washington, DC, Lincoln issued the proclamation in late 1862, to take effect in January 1863. Clay resigned his commission in March 1863 and returned to Russia, where he served until 1869. He was influential in the negotiations for the purchase of Alaska. Later, Clay founded the Cuban Charitable Aid Society to help the Cuban independence movement of José Martí. He also spoke in favor of nationalizing the railroads, and later against the power being accrued by industrialists. In 1869, Clay left the Republican Party. This was partly due to his opposition to President Grant's military interference in Haiti. [page needed] He also disapproved of the Republican Radicals' reconstruction policy after Lincoln's assassination. In 1872, Clay was one of the organizers of the Liberal Republican revolt. He was instrumental in securing the nomination of Horace Greeley for the presidency. In the political campaigns of 1876 and 1880, Clay supported the Democratic Party candidates. He rejoined the Republican party in the campaign of 1884. Clay had a reputation as a rebel and a fighter. Due to threats on his life, he had become accustomed to carrying two pistols and a knife for protection. He installed a cannon to protect his home and office. As he aged, Clay became increasingly eccentric and paranoid. In 1878 after 45 years of marriage, Clay divorced his wife, Mary Jane (Warfield) Clay, claiming abandonment after she no longer would tolerate his marital infidelities. At the 1890 Kentucky Constitutional Convention, Clay was elected by the members as the Convention's President. In 1894, the 84-year-old Clay married Dora Richardson, the 15-year-old orphaned sister of one of his sharecropping tenants. Cassius Clay died at his home on July 22, 1903 of "general exhaustion." Survivors included his daughters, Laura Clay and Mary Barr Clay, who were both women's rights activists. 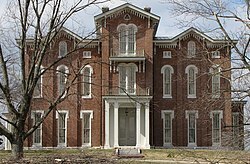 His family home, White Hall, is maintained by the Commonwealth of Kentucky as White Hall State Historic Shrine. In sending these ships to this country, there is something significant. What will be its effect on France, and French policy, we shall learn in due time. It may be moderate, it may exacerbate. God bless the Russians. This action of the Emperor Alexander II was confirmed in 1904 by Wharton Barker of Pennsylvania, who in 1878 was the financial agent in the United States of the Russian government. Herman Heaton Clay, a descendant of African-American slaves, named his son Cassius Marcellus Clay—who was born nine years after the death of the emancipationist in tribute to him. This Cassius Clay gave his own son the same name, Cassius M. Clay, Jr., a heavyweight champion boxer who gained international renown and changed his name to Muhammad Ali after his conversion to Islam. Clay, Cassius Marcellus (1886). The Life, Memoirs. Writings, and Speeches of Cassius Marcellus Clay showing his Conduct in Overthrow of American Slavery, the Salvation of the Union and the Restoration of the Autonomy of the States. I (1 ed.). Cincinnati, Ohio: J.Fletcher Brennan & Co. Retrieved 4 June 2016 – via Internet Archive. Wikimedia Commons has media related to Cassius Marcellus Clay. ^ Smiley, David L. (1962). Lion of White Hall: the life of Cassius M. Clay. Madison: University of Wisconsin Press. p. 31. ^ Richardson, H. Edward (1976). Cassius Marcellus Clay: Firebrand of Freedom. Lexington: University Press of Kentucky. p. 145. ^ Kestenbaum, Lawrence. "The Political Graveyard: Index to Politicians: Clarke-streett to Claytee". ^ Lockwood, John (2011). The Siege of Washington. Oxford University Press. p. 95. ^ a b David Borgenicht; Turk Regan (1 July 2010). The Worst-Case Scenario Almanac: Politics. The Worst-Case Scenario Survival Handbook. Chronicle Books. pp. 94–. ISBN 978-0-8118-7359-8. Retrieved 20 July 2013. ^ Frank A. Golder. The Purchase of Alaska. The American Historical Review, Vol. 25, No. 3 (April 1920), pp. 411–425. ^ Official Report of the Proceedings And Debates In the Convention Assembled At Frankfort, On the Eighth Day of September, 1890, to Adopt, Amend, Or Change the Constitution of the State of Kentucky. Frankfort, Kentucky: E. P. Johnson, printer to the Convention. 1891. p. 25. Retrieved 25 January 2019. ^ Richardson, H. Edward (1976). Cassius Marcellus Clay: Firebrand of Freedom. Lexington: University Press of Kentucky. pp. 89–92. ^ Anna Rohleder. "Muhammad Ali's Boxing Day Gloves". Forbes. Retrieved 2008-08-06. Chisholm, Hugh, ed. (1911). "Clay, Cassius Marcellus" . Encyclopædia Britannica. 6 (11th ed.). Cambridge University Press. p. 470. Carlée, Roberta Baughman (1979). The Last Gladiator: Cassius M. Clay. Berea, Ky.: Kentucke Imprints. ISBN 0935680004. Ellison, Betty Boles (2005). A Man Seen But Once: Cassius Marcellus Clay. Bloomington, Ind. : AuthorHouse. ISBN 1420890174. Johnson, E. Polk (1912). A History of Kentucky and Kentuckians: The Leaders and Representative Men in Commerce, Industry and Modern Activities. Lewis Publishing Company. pp. 744–745. Retrieved 2008-11-10. McQueen, Keven (2001). Cassius M. Clay, "Freedom's Champion" : The Life-story of the Famed Kentucky Emancipationist. Paducah, Ky.: Turner Publishing Company. ISBN 1563116677. Richardson, H. Edward (1976). Cassius Marcellus Clay: Firebrand of Freedom. Lexington: University Press of Kentucky. ISBN 0813114187. Smiley, David L. (1962). Lion of White Hall: the Life of Cassius M. Clay. Madison: University of Wisconsin Press. This page was last edited on 24 February 2019, at 04:03 (UTC).